Gowran AC and Young Ireland’s 5th annual Stook 10 Mile and 5k Challenge takes place this Sunday the 27th of November. Since the first race in 2012, Stook has earned a reputation as a tough but enjoyable mid-winter road race that offers a friendly and welcoming community atmosphere. It attracts runners across a wide range of abilities and is very popular with runners from running clubs, bootcamps, triathlon clubs – with various clubs in Kilkenny, Carlow, Wexford, Waterford, Laois, Tipperary, Cork, Kildare, Dublin, Wicklow and Meath taking part in the past. The route for the 10 Mile is challenging with a substantial hill incline but what goes up must come down and the aptly named Flying Mile is part of the downhill section of the race. With timing mats at either end everyone gets a personal split for that single mile. Gary O’Hanlon (Clonliffe Harriers) holds the record at 4:25 for the men and Kilkenny athlete Adele Walsh (St. Senan’s) and Angela McCann (Clonmel AC) hold the women’s record at 5:37 for the mile. 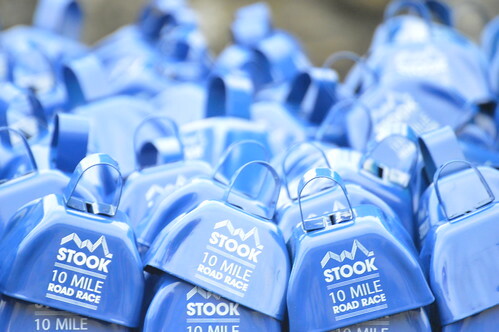 The race is chip-timed and 10 mile finishers receive a unique Stook Cowbell. Despite its athletes coming from far and wide, Stook has always been a local race too. Dungarvan and Gowran parishes are very proud of their race and the community effort that goes into the day is second to none. One of the highlights of the race for runners is the post race refreshments provided by the parish on the day. Nobody leaves the village of Dungarvan hungry, thirsty or empty-handed. In the build-up to Stook this year, Gowran AC have been involving the local community even more. A very successful “Couch to 5k” programme started in september on Thursday evenings in Paulstown, catering for enthusiasts of all abilities and fitness levels. This event was organised by a number of Gowran AC Senior athletes who provided their own experience and expertise to encourage and motivate. Forty people started the programme the first night despite rain and wind. This determined group continued to this weeks where the flurry of snow was no deterrent. The group are ready to take on the 5k Challenge on the 27th and may even become familiar faces at our club training sessions post-Stook! Many of the local primary and secondary school children are currently members of Gowran AC. Gowran AC attract members from Gowran, Paulstown, Clara, Goresbridge, Borris and St. Mullins, to mentions a few. Earlier this year Gowran AC held training sessions in Gowran and Borris National schools during the April Active School Week. To follow up on this success, a “5k-Fit” active programme was launched in Gowran National School, which culminates in children taking part in the Stook dash with their friends and family. The teachers and trainers created and implemented a fun range of activities to cater for all interest and fitness levels. The Watershed Sports Complex were very supported and gave a November Discount to Gowran National School to encourage the children to include swimming as part of their weekly active lifestyle. 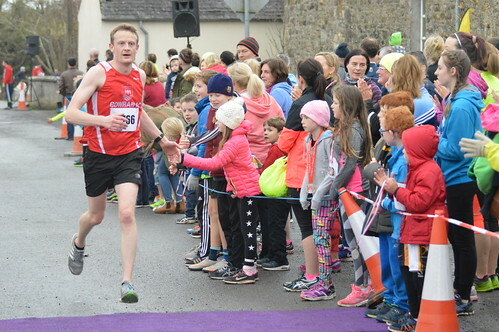 Gowran AC feel that building positive habits for life can be a shared effort between schools and sporting organisations and it will continued to collaboration with the local schools in the future. On Saturday 5th, a large contingent of Gowran AC athletes, of all ages, completed the Kilkenny Parkrun. Parkrun is a fantastic, well run, weekly free event in Kilkenny Castle park. Race director Howard Triggs, a Stook 10 Mile Finisher, brought his own Stook Cowbell to spread the word of Stook to the Parkrun audience. 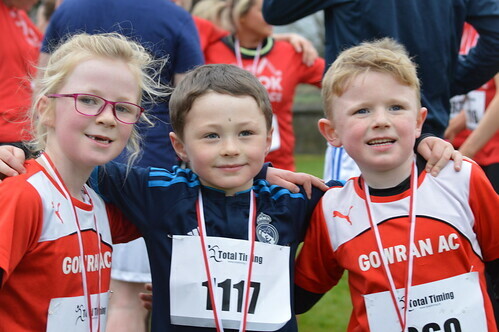 Gowran AC Academy runners (5-6 year olds) also rang Cowbells to cheer on the runners during the 5K. While there are many runners who will be training hard for that Stook PB, for others this will be the first time to complete a 5k. No matter what the outcome, all effort is a fantastic achievement. Stook 10 Mile and 5k Challenge is looking to be a fantastic opportunity to get out and get active with family and friends. For more information and registration details go to www.stook10.ie or contact race director Simon O’Dwyer at 086 2863640. Sweet mother of Jesus that's what you call a race! Top notch from start to finish lads. Well done to all involved. This is now a definite race to do in the calendar every year. Hon the hills! Fantastic race, great support, savage course, perfect weather and some feed at the end. Highly recommend it to anyone who hasn't been.Can't wait to go back.